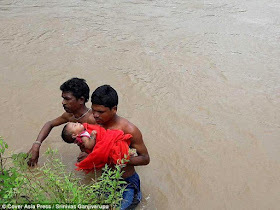 A desperate father carried his sick baby daughter on his head and walked for two hours through deep floodwaters to reach the nearest hospital in India. 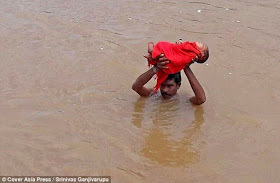 Pangi Satibabu, 30, a farmer, from Kudumusare village in Andhra Pradesh, carried his six-month-old daughter above his head for three miles to the nearest health centre after heavy rainfall led to a deluge. 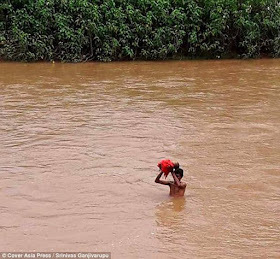 Mr Satibabu was worried about his daughter’s high fever but all the roads connecting his village to other parts of the state and nearby hospitals were flooded. But this week, when her temperature had still not come down, he decided to walk despite his family warning him of the risks. The little girl was eventually admitted to the Primary Health Centre in Chintapalli, where she was tested and treated for a viral infection. Dr Yerramsetty Venkatswararao said: ‘The child is still in hospital but is out of danger.